Happy Friday, friends! I know I haven't posted in a while and I'm sorry! December just keeps getting busier and busier and time gets away from me with all of the Christmas parties, Disney days, and shopping for presents. So because of all of that, this week's High-Five for Friday is going to be a combination of the past few weeks, because a lot has happened that I haven't shared and I want to let you guys know! 1. 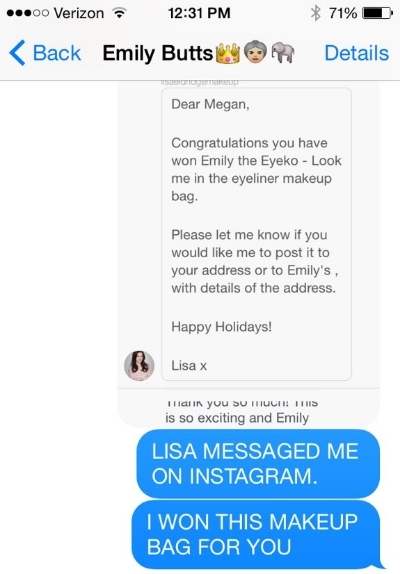 LISA ELDRIDGE IS SENDING EMILY A CHRISTMAS PRESENT! So a few weeks ago Lisa Eldridge put up her Christmas Gift Guide and you could win one of the pieces she featured. It was really cool because the way you entered was by saying who you were going to give the gift too, meaning you couldn't keep it for yourself, since Christmas is all about giving. There were a ton of entries, and I was pretty sure I wasn't going to win what I wanted for Emily. Well the Saturday after Thanksgiving my phone went off and I had a message from Lisa saying I had won the makeup bag I entered in for, for Emily! I promise there's no better present than one from your favorite makeup artist! 2. MEG'S GIFT GOT HERE! My friend Meg and I did a Christmas gift exchange. Meg lives in Wales and I live in the US, so it was really fun trying to get things that were very American and wrapping them all up to send away. Meg did the same thing and got very Welsh things to send to me, and I've eaten almost the whole bag of Vitmo candy she sent, because delicious! There's a whole video of me opening Meg's box over on my YouTube Channel if you want to check it out! Disney at Christmas is the best time to be at Disney! There isn't anything that Disney leave undecorated, and it's so beautiful. This year, I got to go see Disney at Christmas with my parents and it's one of my favorite Christmas traditions. Not only because I'm obsessed with Disney, but because it's something we all love to do together! While we were at Disney last weekend, we were lucky enough to nab a reservation at Iron Chef Morimoto's new restaurant, Morimoto Asia! Let me just tell you something, if you ever are in the Orlando area, go! It was so good! Everything from the decor to the waitstaff to the food was impeccable. The best part of any meal for me is dessert and Morimoto Asia didn't disappoint there either. We got two different ones because they all sounded so good. But what I loved most about one of our desserts (churros) was that it came with a tube of nutella. So when there was still half a tube left when dessert was done, I may or may not have just sucked all of the nutella right out of the tube. 5. I MET FLYNN RYDER! It's been a major Disney dream of mine to meet Flynn Rider from Tangled ever since the movie came out. Well last week at Disney that dream came true. My fam and I went to Mickey's Very Merry Christmas Party and found out Flynn met with Rapunzel there. Well we waited in the line, I got more excited than the four year old behind me, and it was the best day ever! Well, that's it for this weeks High-Five for Friday! What was awesome about your week? Let me know in the comments. Like this post if you're excited about Christmas being just two weeks away!